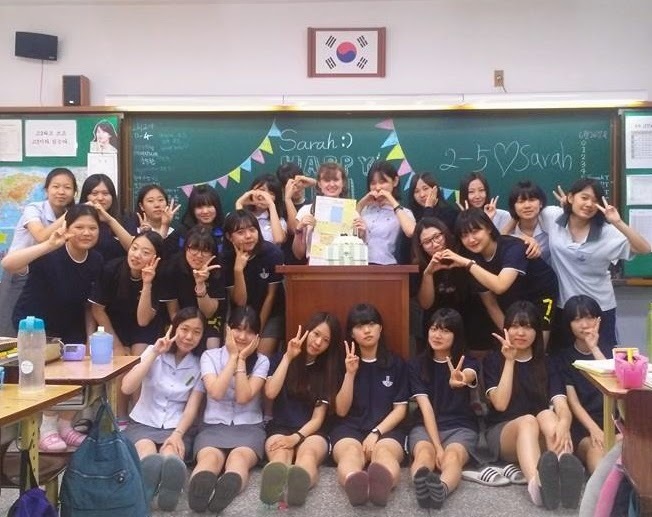 Sarah Goes To Korea: A year in review. Things have been so crazy lately that it's hard to believe my one year anniversary of being in Korea has already come and gone. I wanted to do some sort of reflective post on it at the time, but things were just too insane with the farewells and new schools. Better late than never though, and in this case I think late is actually better than if I had done it on time. Things have changed a lot over the past month, and it's actually given me some perspective on everything I experienced last year. I've decided to choose a significant photo (or two or three) from each month I've been in Korea. There were hundreds to choose from, but I tried to pick the ones most meaningful to me. Enjoy! Ahhh, my first meal in Korea. This probably seems like a strange photo choice, but I will never, ever forget how I felt eating this meal when I sat in the cafeteria at Jeonju University. After months of paperwork and questioning my decision to move abroad, I was actually in Korea, on the other side of the world from my friends and family. It was that time when so many things seemed strange, including this weird mix of "breakfast" foods. Nonetheless, everything was new and exciting and even the simplest things were an adventure, even breakfast. This photo was from when I was in Ulsan during Chuseok break. This was the very first time I traveled after moving to Jeomchon. It's funny to think about now, but navigating the buses felt like such a huge accomplishment at the time. I'll never forget the sense of relief I felt when I stepped off the bus and successfully met my friends in Ulsan. My very first of many festivals in Korea was the Omija festival at the end of Chuseok break last year. At the time I didn't know the other Jeomchoners I went to the festival with very well, which seems so strange to think of now. 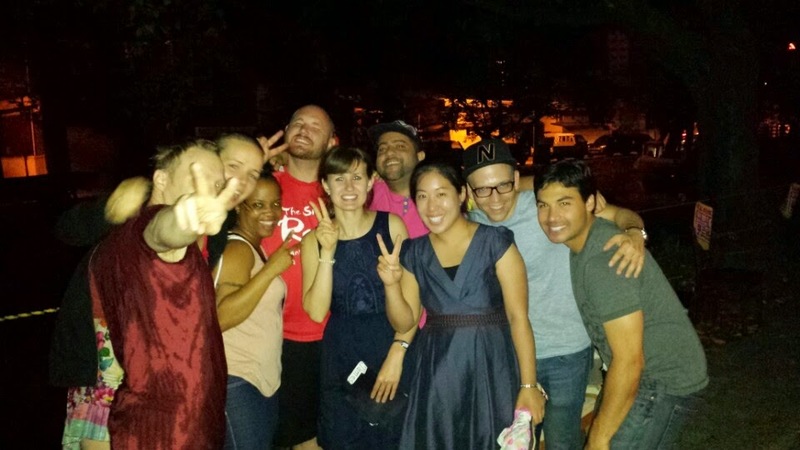 This was one hell of a way to get to know each other, as the festivities continued on into the next morning and included classic moments such as eating grasshoppers and my first time at noraebang in Jeomchon. It definitely set the tone for the rest of the year, and looking at these festival pictures almost feels like looking at my baby photos now. The Color Run was my first time going to Seoul and staying with my friend Jackie, who I had only met a month beforehand. It was the first of many legendary weekends that I still think of each time I go to Seoul. This photo reminds me of the beginning of my friendship with not only Jackie, but just about every other person in this photo. Again, I can't help but think "aw, we were such babies then!" 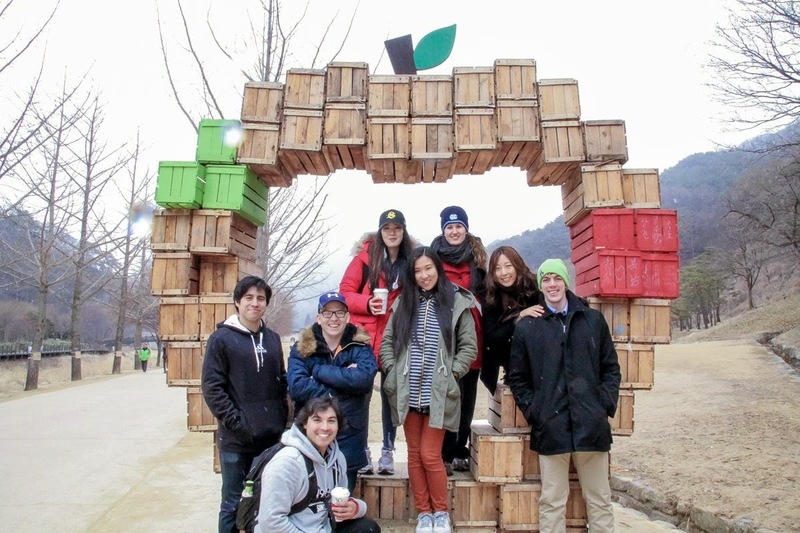 This trip to Chucheon during one of our long weekends in October was my first weekend trip with people from Jeomchon. It was the first of many adventures out of town, and provided some of the most classic moments that we continued to reminisce about throughout the rest of the year. 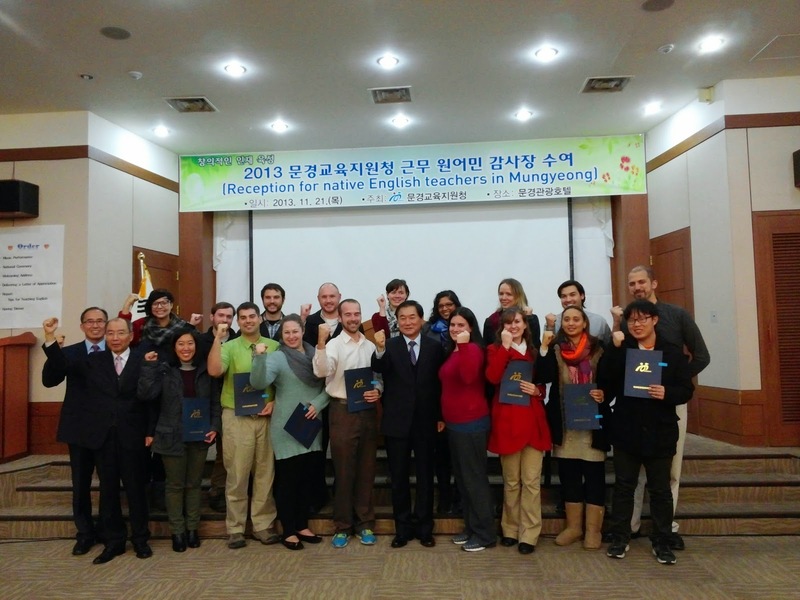 This is from an appreciation dinner that was held for all of the teachers in Mungyeong. I'll never forget going to this event and realizing how special it was to be part of such an amazing community. It's funny that I felt so close to everyone at the time, but looking back on it I was still so early into my time here. I think that just goes to show how much everyone welcomed me and made me feel a part of the community so quickly. This picture was from the first snowfall, which funny enough was one of the only snowfalls we had during the winter. The students all ran outside like little children bursting with excitement at the sight of the snow. My supervisor insisted on taking this photo with me, and I'm glad she did because she is truly one of the kindest Koreans I've encountered during my time here (and I've met quite a few exceptionally kind Koreans). As the seasons changed and the holiday seasons approached I experienced my first bouts of homesickness, and I'm glad I had wonderful people caring about me at school through those difficult times. My memories from December of course revolve around Christmas. I was lucky to have a wonderful holiday season, even when I was far from home. The trip to Seoul to see Nutcracker was one I'll never forget, especially since it ended with the best Christmas music noraebang session. When Christmas Eve approached, we had a warm gathering here in Jeomchon--I don't think we could have had a more festive holiday evening. Although I missed my family at home, I didn't feel alone while surrounded by so much love, which in my mind is another testament to the amazing community here in Jeomchon. January was the month of Thailand! I was so fortunate that my best friend from home could make the trip all the way to the other side of the world to travel with me. We hung out with tigers, rode elephants, and saw tons of amazing temples in our short time. Sometimes I can't believe that we were really there! 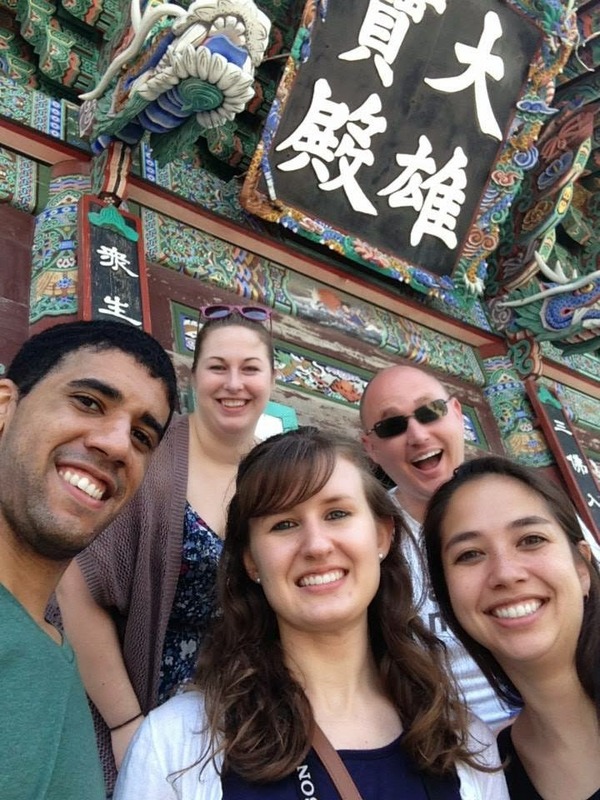 This was my first time traveling in Asia outside of Korea, and was the first time I realized just how much I had become acclimated to Korea. February was my friend Jackie's last month in Korea. I was lucky that my school made me do minimal deskwarming and gave me some extra time off, which I then used to take some trips with Jackie and her mom, who was visiting from Hong Kong. Looking at these pictures, it seems strange that it's now been so long since Jackie left. She is one of my best friends I made in Korea, even if we were only in the same country for six months, and I'm so glad that I got to take these last trips with her right before she left. This one is from a trip to Mungyeong Saejae. This was one of my favorite weekends, during which lots of friends came down here before Jackie left. 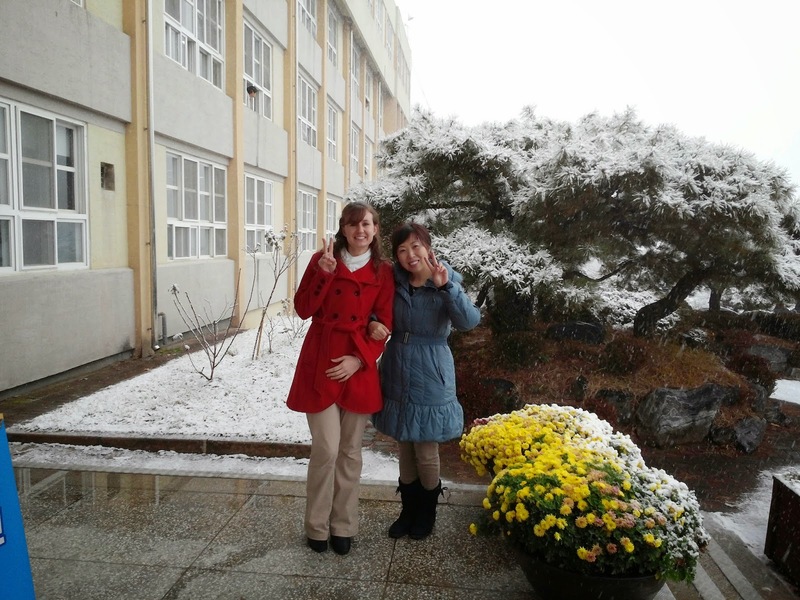 We were lucky enough to be at Saejae for one of the few days it snowed this winter, and it certainly was beautiful. Oh, the Sea Parting Festival in Jindo....when the sea didn't actually part. This weekend did not go even remotely as we had planned, but it is still a weekend full of hilarious memories, and the five hour bus ride down there was entertaining enough to make it worth it. In my mind, this weekend is just proof that sometimes trips don't go the way you expect them to, but that doesn't mean it's going to be any less memorable. March was also the month the new school year began. Although there aren't pictures to represent that, in my mind I will always remember this month because it's when I got a FANTASTIC new group of students. April was the month when the warm air made its way to Korea. Spring was beautiful not only because of the cherry blossoms, but also the abundance of other flowers that were everywhere! It didn't matter where I went, there were flowers all over the place, and it was absolutely beautiful. It was perfect timing to take a trip to Juwangsan, where there were still cherry blossoms and all kinds of other flowers. I'm definitely looking forward to this season again this year. May began with a long weekend, during which we went to the absolutely beautiful Bijindo. This is one of the most beautiful places I've ever been and I will never forget this relaxing trip with fantastic people. At the end of the month I was lucky enough to have two friends come to Korea. What a gift to be able to have people from home experience my life here in Korea. 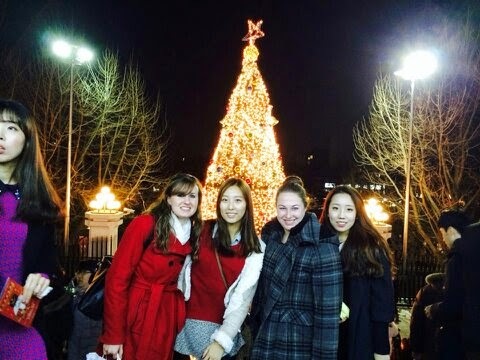 I loved having my American and Korean lives collide for a short time! 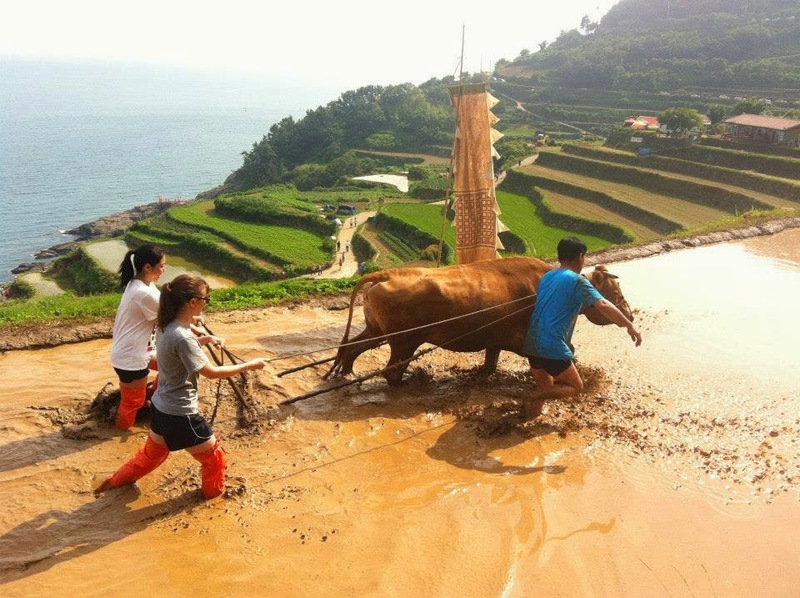 The farming festival in Namhae was definitely one of the highlights from the year. Namahe is absolutely beautiful, and let's get real...when am I ever going to plant rice ever again? In June I also welcomed my 25th birthday. This was a birthday I'll never forget in large part because of the AWESOME students who kept surprising me all day long. I don't think I've ever felt so much love on my birthday before. July was not only HOT, but it was also an extremely busy month. While I'm used to taking it easy in the summer, things only got busier in July. I put a lot of work into my English camp. While it was exhausting, I had a great group of kids to work with and I had a lot of fun teaching it. Have I mentioned how lucky I was to teach such phenomenal students??? July was also the beginning of the end for some people I love dearly. While I was slightly in denial, the countdowns were on, people began to give away their things, and farewell events began. In many ways, it was the calm before the storm. Although I was home for half of August, when I got back to Korea things sure did change quickly. 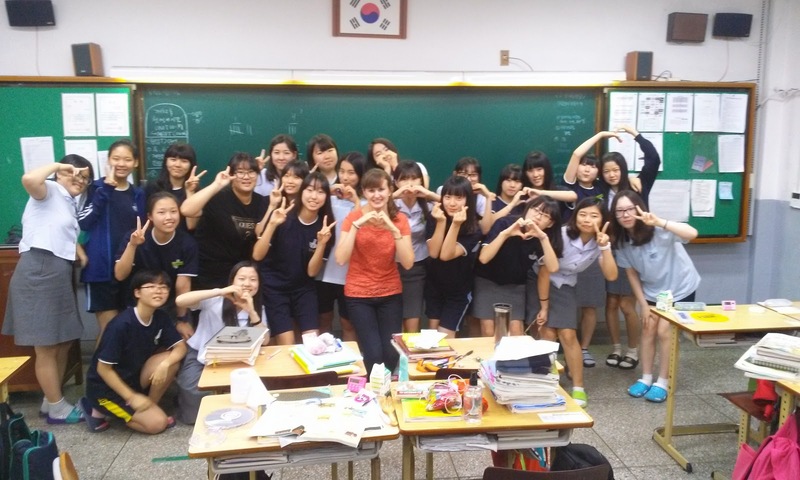 Leaving my students was really difficult, but what was most difficult was saying goodbye to such important people in the Jeomchon community. As a recent friend here recently told me, you have to have a really open heart to be an expat. You not only have to be able to accept people and let them in, but you also have to be able to let them go and say goodbye. Well, accepting people wasn't the problem for me, but letting them go has proven to be a whole lot more difficult. I'm still not used to how empty it feels here in Jeomchon now, even nearly a month later. I'm not sure when things will start to feel normal again, but these changes have taught me a lot. It's easy to get comfortable in Korea. At times it feels like we will all be here forever, but that's not the case in the least. Our lives here are temporary, and eventually we won't have the privilege of living right next to each other anymore. Eventually we're going to be scattered around the globe, separated by huge time differences and expensive plane tickets. These changes have made me much more aware of everything as I head into this second year. Seeing how quickly a year goes by makes me want to take advantage of everything this time around. Although I experienced a lot last year, I don't want to let anything pass me by during my last year in Korea. When I get onto that plane to go back to America in August I don't want to have any "what ifs". I want to know I pursued everything, whether it's something about my teaching, sightseeing, or a relationship. It's amazing how in one year Korea went from being a complete mystery to my home. As I looked through my pictures, I was amazed at how much happened during every single month. There was never a month without trips and FLOODS of memories. 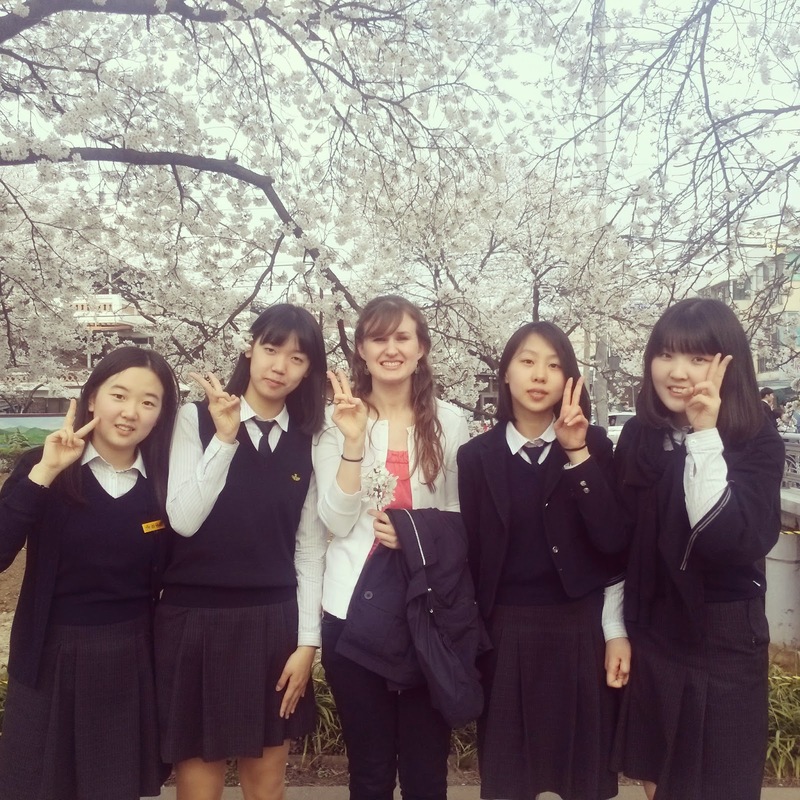 I'm so thankful for all of the experiences I had during my first year in Korea. I can't imagine not having these experiences, and in many ways hard to remember a time what I was like before Korea was a part of me. A year isn't a long time, but my oh my, a whole lot sure can happen in that short time. A Friday Korean Surprise Part 1: Sport's Day! Things co-workers in Korea say.